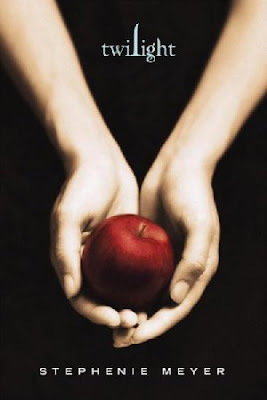 This past week I finished "Breaking Dawn" the last of the four books in the "Twlight" saga. I was late to get on the bandwagon and didn't start reading these books until late January, early February. We don't see movies in the theater ever, and don't watch much TV so while I heard about the Twilight movie and the stir it was causing I was still not that interested. I started reading the series because my BFF Michelle read Twilight and was going on and on about how great it was. Once I started reading I realized how many of my girlfriends had read the books and how they all loved them. The books are like crack! You can't put them down. As soon as I got my hand on one I had the 600 or 700 read in a matter of days. Personally I loved the first book, Twilight. After reading all four of the books it still is my favorite. The third and fourth books are tied for my second favorite. New Moon, the second book starts out slow but finishes good. I knew the movie was coming out on DVD but I was not in a huge rush to watch it. I decided after I finished the last book I would watch the DVD mostly out of curiosity, with low expectations of how they could turn such a great book into a movie. I will have to say I was pleasantly surprised. The movie was lacking of course. Some parts were left out, some were done different, but generally speaking it followed the book well. The characters were cast really well. Bella was right on, so was Charlie, and Renee. Esme and Carlisle looked amazing and just as I pictured them. Alice I thought was also very true to the description in the book. Rosalie, Emmett, and Jasper looked a little old for the age they are supposed to be but otherwise perfect. Edward on the other hand, I was very disappointed in the actor they choose for Edward. Don't get me wrong his acting skills were great and he pulled off the vampire look well but I thought Edward would be hotter, on the level of supermodel hot, and Robert Pattison just doesn't do that for me. Shoot me I know, he has this fan base of worshipers but I don't think he is that hot. So what do you think. Have you read the books? Have you met anyone who read the books and did not love them and was instantly addicted? Have you watched the movie? What did you think? Alright my fellow addicts I mean Twilight fans I want to hear from you. You are so right...those books are soooo addictive. But a good addiction. I love twlight. You know my thoughts on this subject. Love. Love. Love. When I first started reading Twilight and saw a pic of Robert, I was very disappointed that he wasnt hot enough......but the more I read, the more I could imagine him as Edward......and after the movie, I am hooked.......as long as I don't see anymore photos of him tucking....have you seen that? I could not agree with you more. I too have not seen the movie and don't know if I ever will. I just love it in my head too much. You know my thoughts, but I'll tell you again. I loved everything. Minus the second book. It was alright, but I am Team Edward all the way. I think the actors were great. I thought the writing was alright. I knew ahead of time what target group I was reading for, but it still had me hooked. I literally was shaking after finishing book 3. Damn that Stephanie!! She's a terrific writer. I love the Twilight saga and I will do my best to control myself when the new movie comes out. Also, I'm considering re-reading books 1-3 again. I already book 4 twice. SOOOOO good and definitely my favorite.